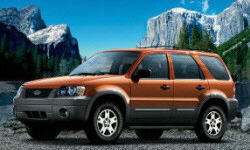 2006 Ford Escape Pros and Cons | Page 1 of 1 | Why Not This Car? What drives people to buy (or not buy) a certain car? 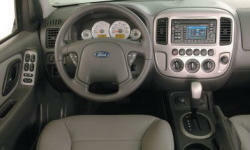 TrueDelta's members share 2006 Ford Escape pros and cons based on their real-world driving experiences. It just looks like and SUV and not a crossover type. I was looking for better mileage. I got 33+ no problem. The car taught me how to drive more efficiently. I am getting 34-35+ in the summer months now. My son has learned to drive the same way by starting with the Hybrid. Looking for a small SUV to replace my 1990 Toyota PU. Do not buy cars often. Consumer report rated Ford Escape high on reliability. Rented this vehicle and drove from Reno to Lake Tahoe. Enjoyed the ride. Bought used only 2 yrs old, 17k, 1/2 off MSRP. Good 4wd system in snow and ice. Not bad performance around town. It looks good. the red color is nice. Though it is car based, it looks tough and I like the way it sits. Bigger tires will help. I love this SUV! Prior to buying my Escape I always had small cars and I was concerned about driving something that felt too big. From day one I felt very comfortable driving the Escape, it drives and handles very smoothly. I was able to put an adult and my two small children in car seats in the rear. I have been able to take my family of four, with luggage, on road trips. Practical and attractive with a durable non painted surfaces on the lower part of the body. This is a hybrid, comparative to other SUVs, this has the highest fuel economy on the market. Currently, I average 30+ mpg, and that is with AWD. It was Blazing Cooper or nothing for me.